Get the app and be the first to get Screening Passes, learn about Upcoming Events, and enter our Sweepstakes and more. Take your screening experience to the next level! Use your mobile app to redeem codes for screenings and events. Access the app, enter your code and get your passes. Once you have a redemption code, simply log in or sign up to redeem directly through our app. It takes a minute or less! Once you redeem your code your passes will be accessible in your MY ACCOUNT section of the App at anytime. Plus, we also email you passes to make it even easier to attend screenings and events. 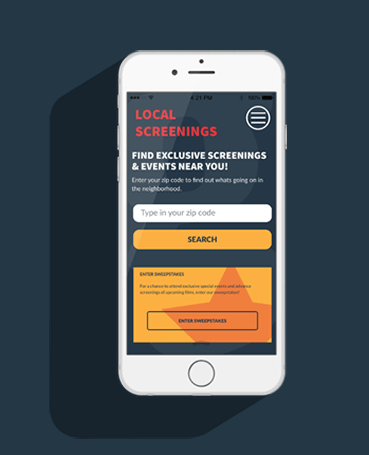 Easily FIND and DISCOVER free exclusive screenings and events in your local area. Be the first of your friends to attend the latest blockbuster movies, tickets to the best shows and concerts.